Scope verification is a formal process for deliverable acceptance. This process comes under Scope Management Knowledge Area. There is a bit of difference between Scope verification and Quality Control process. Quality control – deals with correctness of the deliverable & meeting the quality requirements specified for the deliverable. Generally, Quality control is performed before scope verification or can be in parallel with scope verification. 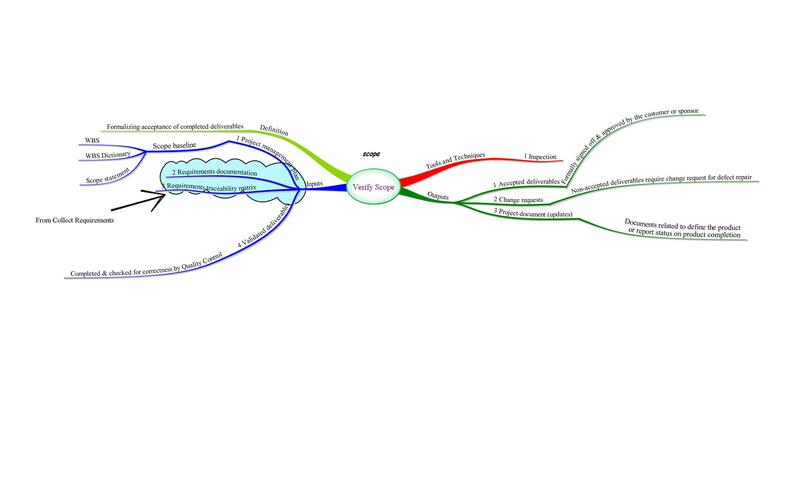 Below is the Mind Map of Verify scope process. I tried putting as much information as possible in each branch in this process map to bring out completeness to it. Hope this will be useful to you. * Note# 1: There could be some typo or presentation errors. Please reply back for any corrections. * Note# 2: You can use this for personal use (like studying for PMP Exam or PM activities). But don’t share this in common forum or web sites. As this one is part of my training guide and project management book. This entry was posted in Inputs, ITTO, Monitoring and Controlling Process Group, Project Management, Scope Management and tagged Inputs, ITTO, Monitoring and Controlling Process Group, Project Management, Project Management Mind Maps, Scope Management, Verify Scope. Bookmark the permalink. This is a really good mind map! Have you considered adding your maps to the mind map library at http://www.Biggerplate.com for others to see? The site is totally free to use and we would love to see your maps hosted there too! Best wishes, and happy mapping!